With its delicate, fan-shaped flowers and evergreen foliage, scaevola (Scaevola aemula) adds year-round color and texture to perennial beds and hanging baskets. It is an adaptable and low-maintenance plant, requiring little more than routine feeding and watering once established. However, scaevola will possess a healthier, more attractive appearance and longer lifespan if grown where its needs are met. A close-up purple Scaevola petals around a green center. Scaevola grows well within U.S. Department of Agriculture plant hardiness zones 9 to 11, although its hardiness varies within that range. It will tolerate light frost, but may die back with the moderate frost and brief, below-freezing temperatures common in USDA hardiness zone 9. Gardeners in cooler climates often grow scaevola as an annual because of its remarkably fast growth rate. However, it can also be grown as a tender perennial in cooler areas by potting it up in autumn and overwintering it indoors. Scaevola originated in Australia, where it has adapted to grow in arid coastal areas. It tolerates salt spray, drought and loose, sandy soil with ease, but will possess a more lush, desirable appearance if grown under less harsh conditions. Grow scaevola 12 inches apart in a bed with fast-draining, moderately fertile soil, or grow several plants in a 10-inch container filled with standard potting soil. Amend sandy soil with a 4-inch layer of compost to improve its moisture retention, and amend very rich, heavy soil with a 4-inch layer of sand to improve its drainage. Full sun exposure is best in mild coastal areas where extreme temperatures are rare, but they should be provided with dappled shade in hot, dry climates. In desert climates, shield scaevola from intense late afternoon sun to prevent scalding. Mature scaevola tolerates moderate drought, but it needs regular watering during its first season in the garden to establish its roots. Garden-grown scaevola needs an inch of water weekly from spring until autumn, and each plant should be surrounded with a 2-inch layer of shredded bark mulch to help conserve soil moisture. Potted scaevola needs more frequent water due to the restricted soil; they should be checked at least twice weekly and watered whenever the soil is dry on the surface. When watering, saturate the soil until the excess water drains from the bottom of the pot. Avoid overwatering; consistently wet soil causes otherwise healthy scaevola plants to lose vigor and it may cause premature death. Despite its tolerance for poor soil, scaevola performs best when routinely fertilized throughout the growing season. General purpose, 15-15-15 ratio fertilizer works well for most scaevola plants, although those with lackluster blooming may benefit from a 7-9-5 ratio fertilizer specifically designed to promote flower production. Mix the fertilizer at a rate of 1/2 teaspoon per gallon of water. Apply it once a week from spring until early autumn. Root burn can occur when fertilizer is applied to dry soil, especially if it is sandy or porous, so always apply fertilizer after watering to protect the scaevola's roots. 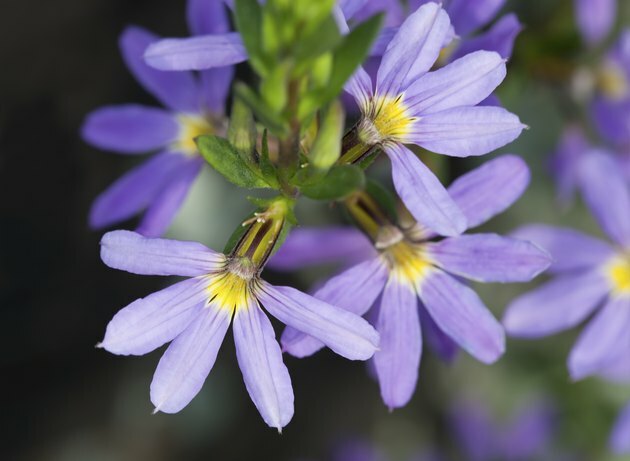 Within its preferred USDA hardiness zone range, scaevola will survive the winter outdoors with no special preparation or care. In colder climates, scaevola will die back with the first hard frost and must be potted up and overwintered indoors to maintain it as a perennial. Dig up scaevola in autumn a few weeks before the first anticipated frost and pot it in a clay pot with multiple drainage holes at the base. Move it indoors to a sunny, south-facing room where temperatures stay above 40 degrees Fahrenheit. Water sparingly while overwintering, providing just enough moisture to keep the foliage from wilting. In spring, transplant the scaevola back into its bed after the soil warms and all frost danger has passed.